Waterfall near Thirlmere i the Lake District. Fuji XT2. Many of you will be aware of my frustration over the poor results when processing Fuji RAW files with Lightroom. This apparently is a well-known problem amongst Fuji users who want to shoot RAW (although it wasn’t well known to me when I purchased my XT1). The problem seems to have spawned many different solutions among users, from trying to work with Lightroom using “quite extreme” settings to adopting other RAW converters. I personally have pursued and experimented with this last option myself, but it’s not ideal. Lightroom is a great tool and provides an excellent workflow. Then, a few weeks back I reported here that following experimentation, I was now able to achieve improved sharpening results when using Lightroom. This involved minimising the use of the Detail and Threshold slider, then applying a subsequent Structure adjustment in Viveza. What I couldn’t rationalise though is why I was now experiencing such an improvement by holding back on the Detail slider when previously it had often been necessary to push this to 100%. Then the penny has dropped. I had been contacted by a couple of Fuji users who asked if I was aware of any improvements to Fuji sharpening in the latest release of Lightroom and Photoshop. Whilst I hadn’t seen anything, it made me realise that I had upgraded to the latest Adobe CC release, just before experiencing the improvement. I have since processed a lot of XT2 RAW files and all are responding very well to a traditional sharpening and processing approach in Lightroom. In a recent comparison with my Sony A7r (with which I use with Canon L Series lenses), the resulting images are similar except the Sony has slightly larger dimensions and is slightly sharper at full magnification. Both images produce an excellent print where you can’t see any difference. Here is an example comparison at 100% magnification. 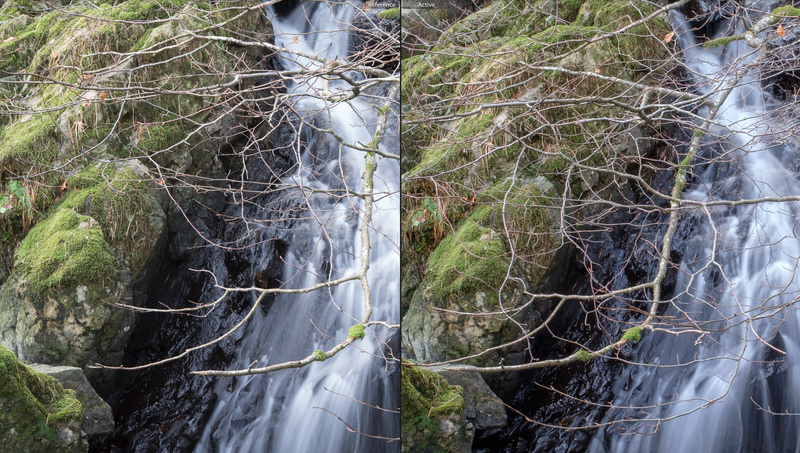 The image on the left was captured using the Sony A7r whilst the image on the right is the Fuji XT2. I wondered if this was just an effect when sharpening the XT2 RAW files, so I returned to my XT1 files and tested some of these. The results are also much improved. Comparing the results from Lightroom to the same file processed using the Iridient RAW converter, the gap has narrowed. The Lightroom results now appear much closer to those from Iridient when applying just Capture Sharpening. The Lightroom results can then be improved by applying Selective Sharpening in Lightroom as well as Structure adjustment with the Nik Tools. Due to the workflow in Lightroom and my use of other cameras (Olympus EM5 and Sony RX10 & A7r) I suspect I will be using Lightroom for most of my Fuji RAW conversion. I may have occasion to venture into Iridient or RAW Therapee but where I need to work fast I think Lightroom is now up to the task. I’m interested to hear if others have any similar experiences to share. Many of you reading this will be aware of my move to a Fuji XT1 and the concerns I had regarding the image quality. Now to be clear, it wasn’t that the image quality was bad but rather under certain circumstances fine detail was lost during the RAW conversion in Lightroom. Sometimes foliage would have an unusual appearance that was almost false. In the following screenshot you can see a section of the above image at 100% magnification (you may need to double click the image to view it at full resolution). Whilst this isn’t a severe problem I don’t care for the detail in the image foliage as much as I do the results of other RAW processors I have now found. Since encountering this I have been experimenting with a number of RAW converters including RAW Therapee and Iridient. I am very impressed with both of these as RAW converters but they lack some of the tools of Lightroom and/or are a little trickier to use. RAW Therapee for example has a very large selection of tools in an interface that’s hard to grasp initially. In the following image you can see the same image processed with Iridient, also at 100% magnification. Although lacking in midtone contrast, the image is more natural in appearance and there is greater detail in the foliage. And here is the RAW Therapee conversion at 100%. Again, this has more detail and is sharper than the Adobe version but also looks more natural. I also prefer it to the Iridient version if I’m honest. I have now come across another RAW converter that clearly has parallels with Lightroom, even offering some of the same functionality. 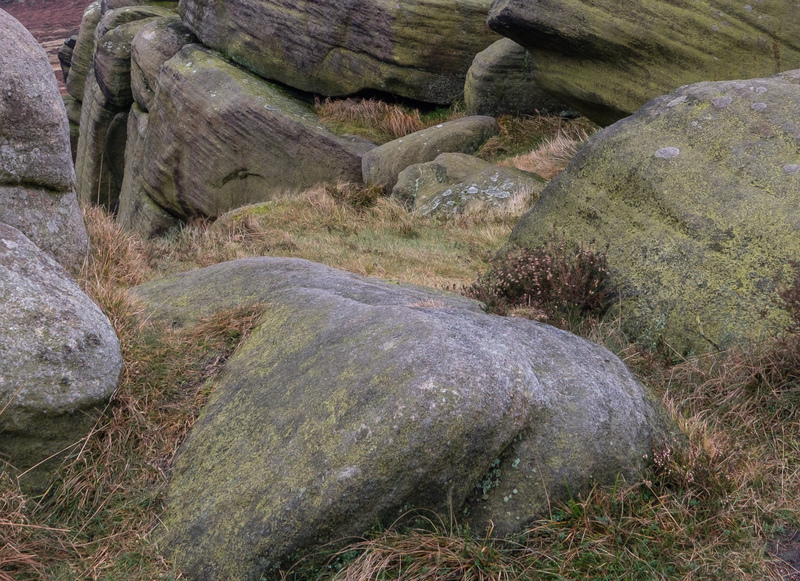 Although it’s not as easy to use or quite as well designed as Lightroom, it does seem to produce images with excellent levels of detail and sharpness. This is also true when processing XTrans RAW files and so may be another alternative for people who want an alternative to Adobe. Best of all the software is Free and the enthusiasts behind this project are to be commended. The only potential downside is that it’s not available on the Windows platform but if you use a Mac, you really should take a look at the software. 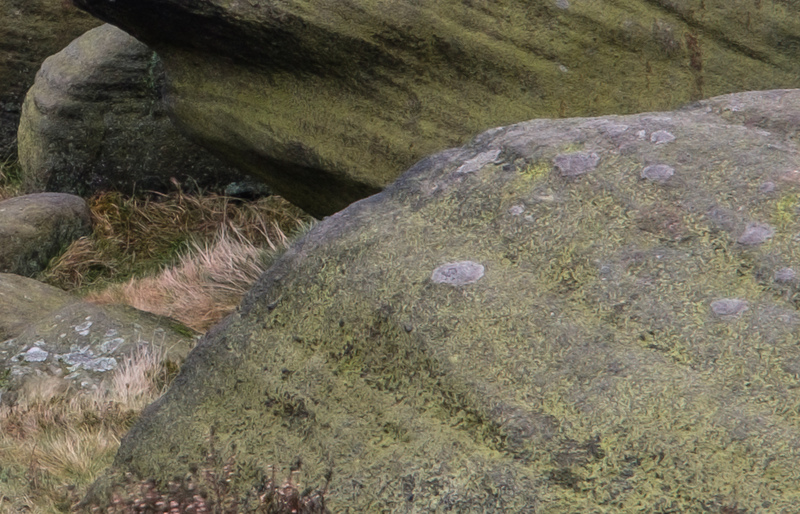 Here is a section of the image at 100% (I apologise for not matching the colour and contrast but I haven’t yet mastered the processing). The name of the software is Darktable. Test Image 2 at 100 percent magnification. Superb detail from a Fui RAW file. In case you haven’t been following the story so far, allow me to recap. I decided it was time to replace my trusty Olympus EM5 and I was seduced by the great Fuji lenses and the promise of excellent image quality. I purchased a Fuji XT-1 and a couple of lenses only to find problems with the RAW files when I came to convert them – the images look as if they had been painted and lacked crisp details. Apparently this is a well-known problem. The results from all of the lenses can be excellent which leads me to suspect lens quality is a factor in the problem. I have also chosen my words carefully here as I have seen the painterly effect with the 10-24mm when used at the longer end of the focal range. Despite all these improvements, the single biggest factor seems to be the RAW converter used and this can have implications for all of us, even if you’re not a Fuji user. Let’s take a look at an example focussing just on the image quality. What I want to see in my images is plenty of sharp, well defined fine detail as well as getting a feeling of texture in the image. What I don’t want to see is lots of noise. The first thing I have noticed with the Fuji RAW files is that they are incredibly clean and don’t have much noise even when shooting at ISO 800 or 1600. In some cases, they seem unnaturally clean so I have started to shoot at ISO 400 and 800 regularly as I prefer the appearance. Something else you may have read is that the JPEG files are great out of camera and are difficult to improve on. My experience of the JPEG’s is that they are indeed very good out of camera. But when processed well with a good RAW converter, you can easily exceed the results. With this in mind, let’s take a look at an example image. OK, it’s not pretty but it was shot in good light and features the type of detail that people often complain isn’t rendered well by the Fuji. I have checked the image over and its sharp everywhere. 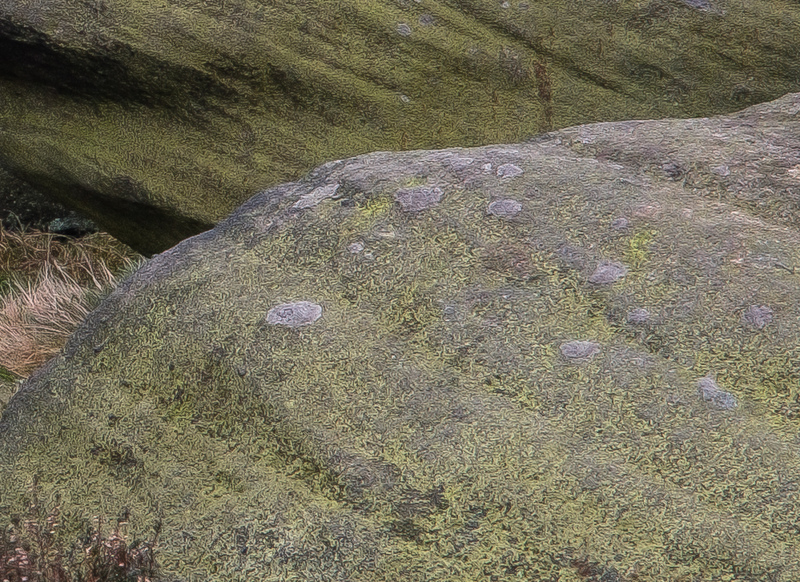 Here is a section from the JPEG out of the camera image at 100% magnification. You may need to click on this to view at full magnification. What you see here is a screenshot of my screen which us 24” and running at 1920 x1080 pixels. This isn’t a very forgiving resolution but is great for sharpening and checking if things are in focus. Let’s now compare this with the RAW file processed in Lightroom. If this doesn’t look quite as sharp and detailed as the OOC JPEG image, I agree. This Lightroom rendering was also using all the tips I could find from the resources on the Internet that readers suggested as well as my own trial and error. An improvement on Lightroom was Capture One which you can see below. A word of warning with this image, it was produced using version 7 pro. I have tried to upgrade this but it just goes wrong with my Capture One 9 Sony only version. The results from version 9 may be better than the above. The RAW file converted in Capture One shows great colour and lots of contrast. The sharpness and detail are marginally better than Lightroom and probably on a par with the JPEGs. Some of the improvement may be contrast related. Next we have Iridient which many people seem to swear by. Apologies for the watermark but this is an evaluation version. The results are very promising and I may well spring for a copy of this. The detail is better than Capture One and the image looks very natural. It’s definitely better than the OOC JPEG. Now for second place runner up and in fact, with some practice I might put this in the winning position but equally I might also relegate it to last spot. This is sharper and more detailed than Iridient but much more difficult to control. I have actually over sharpened this image in the RAW converter. Part of the problem is that the image preview appears to have some form of blurring applied each time you make an adjustment but once you apply the conversion the blurring effect is removed. This may make it very difficult to handle but the results can be very good. Now for the top spot in RAW converters for extracting fine detail and texture and one I recommend for all Fuji users and possibly other camera users as well. This is from RAW Therapee. Yes, you read that correctly. It’s a free RAW converter and it really does blow away the competition with the Fuji RAW files. The OOC JPEG files don’t even come close to the detail that can be rendered by this application. I repeated this testing with a number of files and the results are consistently good. Here is a second test image from the Fuji. And a section of this at 100% magnification. And if you don’t use Fuji, please still try this out as I had great results with the Olympus EM5. I suddenly realised how poor Lightroom was in comparison. Now for the slight downside, the interface for RAW Therapee is pretty poor and the software crashes from time to time. There are that many options available that you probably need a PhD to get the optimum results. Despite this, it’s well worth the effort, especially if you have been plagued by the dreaded painter effect. If you are wondering what happened to the fuji RAW converter from SilkyPix, I started to see quite a lot of artefacts in the tree detail so ruled this out. Equally, I didn’t like the lens distortion from Photo Ninja although the detail and sharpness was good. I have been a user of both of these software packages in the past and they may be worth taking a look at. Finally, I will point out that the painter effect isn’t just as a result of the RAW converter. I’m finding it from time to time in all the RAW converters and in some of the JPEGs. I will post more about what I think is causing it once I have managed a little more research. But for now, RAW Therapee is producing great results. I hope you found this useful. I’m off for a lie down. If you shoot with a small sensor camera and use Lightroom for RAW conversion, then it’s a good idea to take care when sharpening. Noise can be a particular problem when at low ISO settings but there are steps you can take. This video demonstrates how to avoid the ugly sharpening artefacts that can result and which tend to become exaggerated in later processing. It was an early start yesterday. Up at 4:30 in the morning in order to make the 2 hour journey to Ullswater in the Lake District for a dawn shoot. Despite the early morning start it was without question one of the most enjoyable days photography that I have ever had. Overnight the temperature had dropped like a stone and there was a thick haw frost on the ground. Most waters in the Lakes had a thin layer of ice starting to form around their edges but because the temperature had dropped rapidly the deeper water was still cooling. Instead of ice covering their surface they had a wonderful mist and the conditions just got better as the day went on. 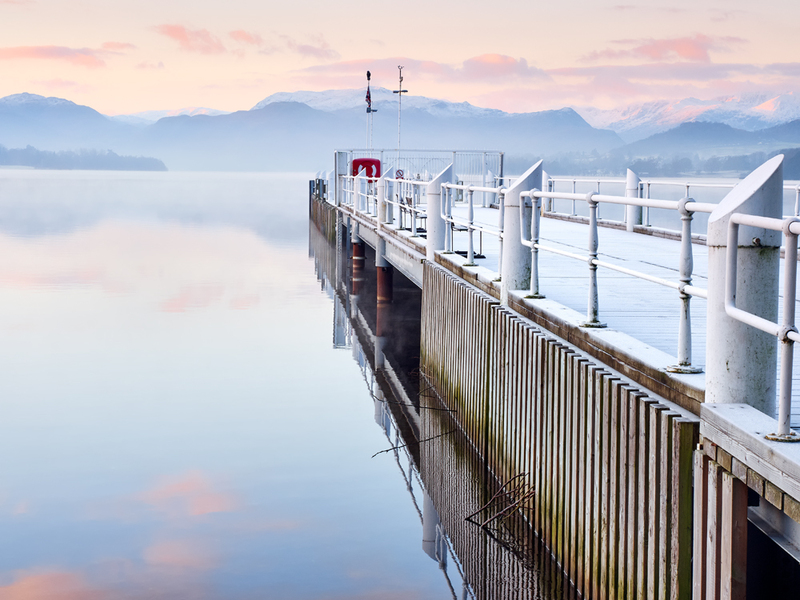 The image you see above is of the boat jetty near Pooley Bridge, at dawn. Captured on the Olympus OMD EM5 with Olympus 12-40mm lens and a 0.3 ND Grad on the sky. Aperture was f/9.0 (a mistake as I would have shot this at f/7.1 usually). ISO200 and shutter speed 1/125″. So you might ask, what is the important decision? The answer is, that I have decided to sell the Nikon D800; but I want to explain and share my reasoning. Firstly, this is the third trip I have made where I can’t bring myself to carry the extra weight. When I returned from Bolivia I suffered a prolapsed disk at the base of my neck and for a while it looked like I might need major surgery. Fortunately, this is looking less likely now but the pain over the past couple of months has been unbearable at times – and pain killers just didn’t have an effect on it. I was finding that even trying to lift and support the heavier equipment was aggravating the pain. OK, so this might be a temporary condition (I certainly hope it is) but other things are more permanent and important. One of the reasons I bought the D800 was that a lot of people were claiming how the image quality is exceptional with the right lenses and I would agree, yes it is. The camera would perform very well even with lesser quality lenses but needed a little more adjustment to really bring this out. But the important point is, the image performance is no better at low ISO (which I use almost exclusively) than the EM5. In fact, the corner and edge sharpness of the EM5 images beats the D800 even with high quality lenses. All I really get with the D800 is an image file that produces a 24.5″ inch image rather than 15.36″ at 300dpi. Does this additional image size matter? Well, unless I am going to be making a print larger than 30″ and look at this with my nose pressed against it. You really need to be doubling the print size to notice the difference in output quality due to the way inkjet printers work. If you print on Matt paper then you might even need to go larger than this. As for output to the Internet, there is no benefit to having more pixels and then throwing most of these away by downsizing the image. Where the D800 does score well over the EM5 is in the RAW files. I seem to be able to push these all over the place in editing and see almost no noise, even in shadow areas. This is very nice but again it comes with a downside. The RAW files from the D800 do seem to need much more processing in comparison to the EM5 RAW files. It’s almost as if the D800 RAW files are a little flat, possibly to the additional dynamic range the camera has. Whatever the reason, it feels like I am having to relearn how to get the most out of the camera and I don’t really have time for that at the moment. The final and most important problem is that the D800 really doesn’t suit my style of shooting. What I don’t like to do is pop the camera on a tripod, spend a lot of time getting into position, check everything and then make one or two good exposures. This just doesn’t work for me. My approach is to move around and into the subject, taking lots of pictures and checking them regularly. As I work I find images that I like or things I like about an image that I work with to incorporate. The shots gradually get better until I arrive at the image I want. This style of working isn’t for everyone but if it’s your style, you will find it hard working with a large DSLR. I do have to admit though that I didn’t always recognise this. It was only when I moved to the EM5 that my shooting style really started to develop in this way and that I started to feel free. Now when I try to go back it’s as though I am constrained and I have lost that feeling of freedom and spontaneity. So, this is my reasoning but I will caveat it with a final thought. I reserve the right to change my mind. As I was writing this I was looking back at some of my RAW files from the D800 and they do have a quality that I really like. I’m just not sure it’s enough to make me want to keep the camera.